Finding new ways of measuring our lives is quite fascinating; for instance June 2016 is now down in the record books as how many times you dash out to take in the washing. Predicting the frequency of showers has moved on from the post Michael Fish days of weekly sayings to the finite hourly doom sheet. Even casting a glance at the heavens is not a true guide now, as the constant layer of porridge and raspberry jam coloured cloud has shown it not always an indication of a belting precipitation. One discarded indication used to be the number of performances the Romford Summer Theatre got in before the heavens opened. Many a tale of soggy and bedraggled actors trying to convince an umbrella laden audience that the Shakespearean play they are watching, is in fact being played out in the relentless sunshine and humid atmosphere of southern Italy. Now that is acting, however, this year’s production of Much Ado About Nothing has set the rule book back to basics. No longer do we need to anxiously glance at the BBC forecast or even the porridge stained sky, but to look at the horizon. Take Friday night’s performance as a good guide. The playing field in Raphael Park was bathed in brilliant sunshine as the last rays of the day picked out the lush green of the grass and the long shadows of the tree lined perimeter. Ten steps away, and I measured them, the Rockery, where the play was being performed, was plunged into a Dickensian mausoleum grey of total depravity and limp rain soaked feathers bathed in irritating drizzle. Come back Michael Fish I say, at least we had someone to blame. The Bard’s comedy is now into its third production tonight (Saturday June18) with a matinee on Sunday and three more performances ending on Saturday June 25. So the message in this blog if you want a good night out of culture, tea and cakes, is to ignore the elements and come and join us in Raphael Park. We have not quite got to the Disney Badge stage of shower survival, because it seems the elemental Gods are still discussing the colour they want to paint on the ceiling. As with most Shakespearian comedies, the dialogue is 1600 but the laughs are definitely modern, and Much Ado is loaded with both. 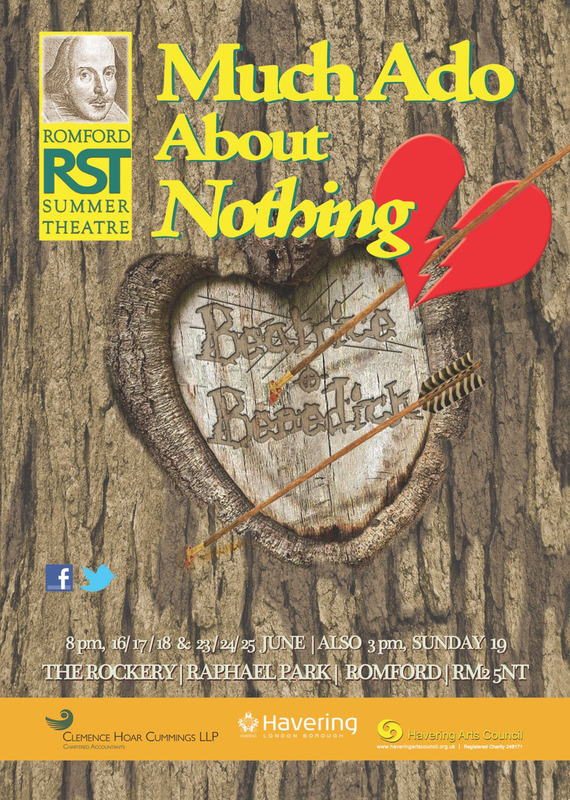 The story of a turbulent love affair between a character called Benedick and his love target, Beatrice, is a mixture of chaos and confusion as played out in every household for the past four hundred years or so. To add to the disbelief, the strong cast of 20 players give a two hour rendition of what can only be described as constant pressure, where a blink could be disastrous. The evening show begins at 8pm on the Rockery which is at the end of the lake in Romford’s premier park in Main Road, with two car parks, one opposite the main Road entrance with a walk by the lake, or the rear entrance of the park where cars are allowed to park on the grass with a short walk down to the stage. Tickets are £10 and £8 and available at the entrance to the enclosure surrounding the Rockery or on line at: http://www.ticketsource.co.uk/event/127728. Sunday’s matinee begins at 3pm, and the last three performances on Thursday June 23 to Saturday June at 8pm. Forget the weather but bring the umbrella and blanket, just in case.